This summer I became the proud owner of a spiraliser. Like many spiraliser owners, I was phenomenally excited to start with and spiralised everything that came into my path but then the novelty wore off and I struggled with ideas more inspiring than carrot and courgette "pasta". 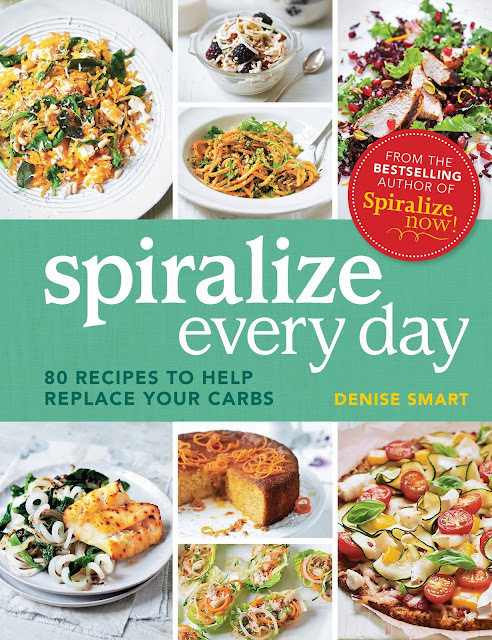 That's why I was interested to read Denis Smart's new cookbook, Spiralize Every Day - 80 recipies to help replace your carbs. Spiralize every day is packed full of recipe ideas that use the different blades you get with your spiraliser. There are lots of recipes based on the "noodle" theme such as butternut squash spaghetti with walnut, or sweet and sour pork with daikon noodles. But as well as this there are lots of ideas you might not have thought of such as using the blades to create think slivers of fruit and vegetables as toppings for cakes, pastries or pizzas. I found lots of the recipes in this book to feel quite light and summery - salads and light bites. I guess that's the nature of carb-free meals though. There are one or two warming heavier dishes such as a cauliflower-base pizza, vegetable lasagne or a carrot-rice style jambalaya. All of the photos of the food look amazing. Because of the distinct lack of carbs, you really notice that the food looks brighter and more colourful. In fact, there are very few things in this book that I don't want to try - they all look so inviting. One section of the book that isn't carb-free is the baking and sweet treats chapter which has some really clever sweet ideas as well as some innovative bread ideas. The girls can't wait to try sweet potato and chocolate chip cookies made with shredded potato. Lara also seems quite tempted by beetroot cupcakes but I'm not so sure how she would feel sprializing beetroot as it can get very messy! If you're looking for ideas of what to do with your spiraliser then I highly recommend this book for a bit of inspiration. It's only £9.99 and I promise there will be ideas in it that you'd never even have thought of. Number one on my list for next weekend is...homemade carrot tortillas wraps with chipotle chicken.